Remember the 'to be continued?' message at the end of my RED game? 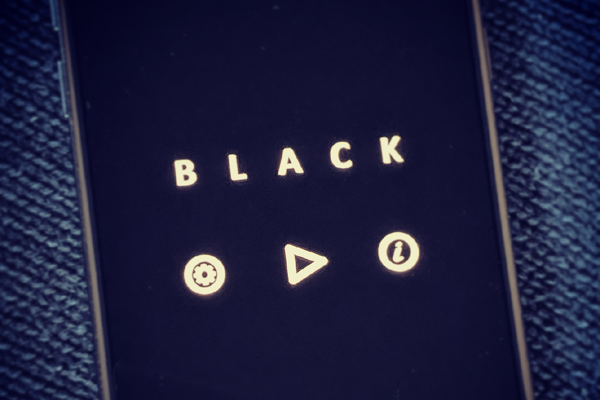 Well... after YELLOW and RED, I'm proud to present you today my latest mobile game in my colour puzzle series, here's BLACK! Can you make the screen black in each of the 50 levels? The game is free but if you want to support my game-making there is a 'premium unlock' in-app purchase which also removes the ads you see when you ask for hints. Let me know what you think about the game in the comments! Enjoy the new game, and of course the new song! Stuck on lvl 25 any help?? Just finished it, awesome work. Thanks for all! First thing I did today was look for this game. Congrats! You have my 5 stars no matter what. Is this ever going to be a browser game? Stuck on 26. I've figured out B and A, but L, C and K? Another great game! 47 was ticking me off, since I totally missed the point (thought it was just memorization), and I had to use clues, but I got the rest of them! Thank you Bart for your great website and fun games! They have provided me hours of entertainment over the years. I am a loyal fan. Yay! I'm so excited I love these games! When should I expect the PC/Mac edition to be finished, guys? Any chance of a desktop version? Eventually there will be a browser version but not right now. It has to be converted to html5 and some levels really wouldn't make sense in the browser so I always make a second slimmed down version afterwards. The fact that yellow, red and black are the colors of Belgium flag is totally a coincidence, right? Another great game, but one suggestion: Some of the levels are very strobe-light-like - they blink a lot and rapidly. I strongly encourage you to post a warning at the beginning of the game so that someone that can't handle strobe lights knows to avoid it - that kind of light blinking can cause seizures. Another fun game - I hope there'll be more in this series! @Everyone Sheesh guys, porting takes time! You waited this long, you can wait a little longer. @Kyriaas I hope so because otherwise it might mean there aren't any more in the series! Good spotting though! I can't get play it for some reason. Loved yellow and red though! Oh, thanks, just read your comment. Thank you for making it! Thank you for making it! Can you put it on https://www.coolmathgames.com/?